The weekend is there, the season is changing, and you are in the mood to give your home a re-look after the summer. Let the 70s inspire you. Warm colours taken from nature, spicy tones: perfect harmonies for autumn. When we look back to the 60s we will see that this was the time where plastic furniture was making a small revolution. In the 70s people were going back to natural materials: cotton, linen, wool, leather, wood, stone. How can we get inspired by the 70s and still be modern? Clean lines, natural colours, leather sofa. The Bouble lamp of Porta Romana is a perfect example of how a ceramic base can look vintage and modern at the same time. Give your wall a bit of structure with the big Croco wallpaper of Elitis, it stays discreet but gives the whole room an interesting and refined touch. Play with some smaller hanging lamps by putting them on different heights, in a warm colour harmony. The District rug designed by Kelly Wearstler will give the room an graphical touch. Your home will look modern with refined details. In the 70s the work week was getting shorter, more free time, time to relax. Designers were looking for new shapes, and new materials made it possible to give more comfort to the sofas. It was the time of the hippies, the generation of Woodstock: tie & dye fabrics, big prints inspired by the Orient, psychedelic print. 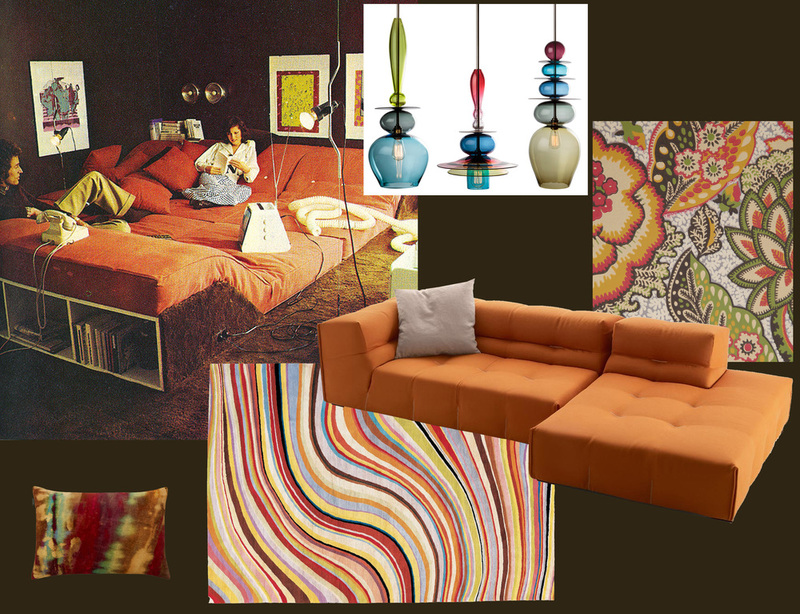 Why not combine one wall with a big flower print and the psychedelic stripes of the Swirl rug, designed by Paul Smith? Wood is creating a very warm atmosphere, brown tones and natural tones, in general are very comforting. It will give a homy feeling. Spice it up with some mustard tones, burned orange, and some big plants. 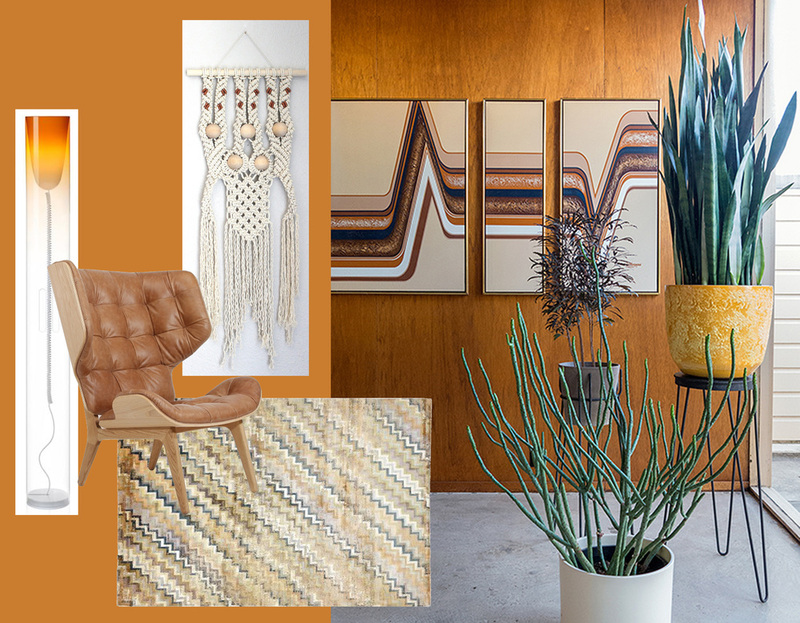 A big graphic print will add the modern touch or are you going for the real 70s touch with a wall hanging in macrame? 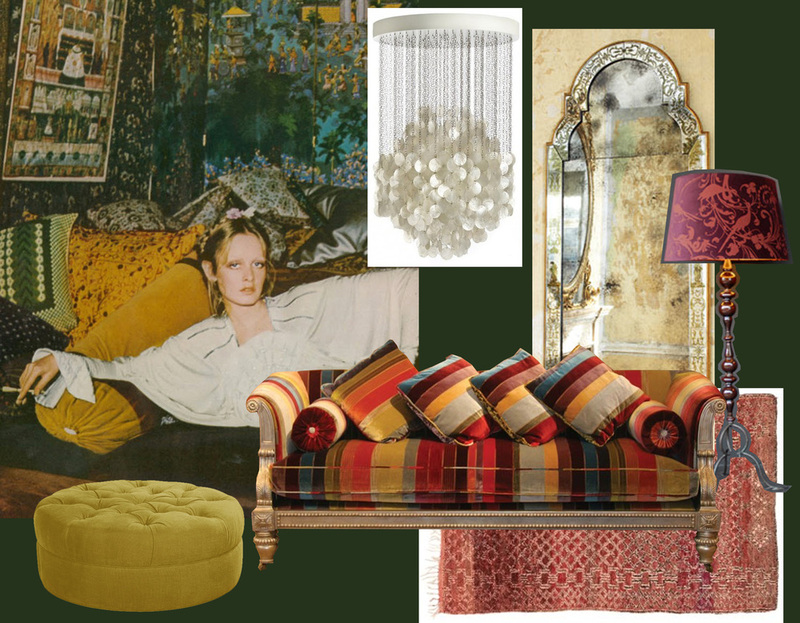 When we think of the 70s than we think of the Biba area, we think of a bohemian style, both are reflecting a style of the beginning of the 20th century. Bohemian style is a very personal where you can mix: vintage pieces, combined with objects which you collected while traveling. Don't be afraid to combine, just do it with confidence and it will reflect who you are. The 70s style can be interpreted in different ways, you can adapt it so it will fit your own personal style. contemporary style by combining pieces in natural tones, clean lines, beautiful materials. modern - artistic approach by combining colors, prints, flowers and stripes. studio look with using natural wood for the walls, decorating with some bold prints, macrame wall hangings, and adding some accent colours. bohemian look by combining different styles, a warm and darker colour harmony, interesting materials. Wish you an inspiring weekend.